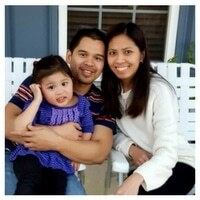 Taking online surveys for cash is one of the many side hustles that my wife and I have done to earn extra money. Over the past couple of years, my wife and I have tested hundreds of paid surveys. Some are really good, and some are really bad. One thing I know for sure is that there are a lot of sites that offer paid online surveys for money. Some even pay in hundreds every month. No kidding on that. In this post, I detail the list of sites that pay survey money. Some of these can even make you money while you are sleep. Pro tip alert: I recommend that you sign up for as many paying surveys as you want. Why? This way, if one doesn't work in your favor, then, you have a ton of others to choose from. There are a lot of paid survey sites to choose from but my favorites are Swagbucks, Survey Club, Survey Junkie, and Ipsos Panel. I call these the “The Club of S… Super”. These are my all-time favorite places to do surveys for cash since they have a much higher pay rate than most. Swagbucks members can earn as much as $35/survey (not to mention you can earn points redeemable for cash/gift cards for just about anything you do like watching videos, reading emails, etc). Plus, make $15 bonus (i.e., $5 sign up and $10 Swag Up). Survey Club members can earn as much as $115/survey for focus groups or quick surveys. One member made $4,000 in a month. Survey Junkie is the one-click setup site known for its transparency on payouts. Not to mention, the ease of making $10 or more in a few minutes. One of the few paid online surveys that have paid over $230M since it opened its doors. Who are they? Swagbucks is one of the few sites that can help you earn money by watching videos, taking paid surveys, and just about anything you do online. It is also one of the best places to take surveys for cash, gift cards, and products. Rewards: Cash paid via PayPal or e-gift cards. Earn extra $5 just for signing up. Plus, make $10 Swag Up when you make your first purchase. Amount from paying surveys: Earn up to $35/survey. Our review: Swagbucks is the “make money whatever it is that you do over the internet” juggernaut in the industry. I have made over $1,500 with Swagbucks (see image above). Try one month of Hulu for $5.99 and get $20. Start with Dollar Shave Club and earn $10. Click here to start with Swagbucks for FREE and receive $15 bonus (i.e., $5 sign up and $10 Swag Up). The one-click setup site known for its transparency on payouts. Who are they? Dubbed as the most popular spot online to earn cash and rewards for sharing your thoughts. It's been used by over 6,000,000 members – a testament of how good Survey Junkie is. Amount from paying surveys: Once you reached 1,000 points, equivalent to $10, you can cash out your money. Since most surveys pay out between 400 and 700 points, it's not hard to reach that threshold. Two surveys and it's possible to earn money fast. Our review: Survey Junkie is fairly straightforward and super easy to use. Tia, a survey money taker, sent me a screenshot of her Survey Junkie earning (above image). She made it in 10 days when on break from her little kiddos. That's $615.56 for a few minutes every day. Just log in using your Facebook or email account, answer 5 basic questions in 10 seconds, and start taking surveys to make money. It's that easy. Click here to start using Survey Junkie for FREE and make money from surveys. The site that pays as much as $115 per survey on select focus groups. Who are they? SurveyClub is the ‘IT' site right now that offers the latest and highest paying research, product test, focus groups, clinical trials, and survey opportunities. Rewards: Cash paid via PayPal, Amazon gift cards, and check. 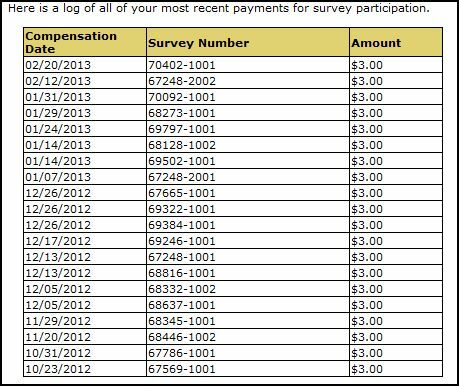 Amount from paying surveys for cash: Current surveys pay between $3 and $115 per survey. Our review: Quite a few people have made $115 per survey for focus groups. This could literally be you. Reports have it that, many times, members get to take 15-minute paid surveys for $50 payout. That's a lot of money for a couple of minutes. One member even made $4,000 in a few days (see image below). The big payouts are the reason that my wife and I love this survey site. It's literally a needle in a haystack in the survey site world. Click here to start with Survey Club for FREE and be on your way to potentially making hundreds of dollars. More than 7M active members, $30,146,900 paid out, and 20M+ legitimate paid surveys taken. Who are they? One of the largest (and best paying) survey-based, paid market research companies around, working with trusted brands and research companies worldwide. Rewards: Cash via PayPal, gift cards, VISA prepaid cards, and donations to charity. Amount from paying surveys: As high as $20/day. From 100 to 5,000 points per survey. Plus, test and own new products for FREE. Our review: This is our favorite. We've been using this since the day we started taking surveys. I know one who earned $40 in just 2 days. Let’s assume that’s $20/day or $620/mo. Imagine yourself making this money and getting FREE products. Click here to create an Ipsos I-Say account now for FREE before registration closes and start earning hundreds of dollars every month and FREE products. One of the best sites for surveys for cash and the one that made me over $1,100. Period. Who are they? Vindale offers some of the highest paying surveys in the industry and is one of those where people make money from surveys the legit way. Rewards: Cash paid via PayPal and check. Earn extra $2 just for signing up. Amount from paying surveys: Earn up to $75/survey. Most surveys pay around $5 to $10/survey. Our review: The surveys are straightforward, and you know right away if you're qualified or not. The more you do, the more payments you'll get. It's that simple. Take surveys now with Vindale Research for FREE. A global research company paid online survey site that paid $32M worth of prizes in 2017.
Who are they? It is best known as as survey for pay site even when people have been disqualified for surveys. When you've done surveys, you know this is unique in the survey world. Amount from paying surveys: Roughly up to $5/survey. Take as many paid surveys as you want. Our review: We love it because we get points all the time and get the way-better chance of getting products than most of the survey sites out there. It's one of the only few best survey sites that gives millions of dollars per year (e.g., $32M in 2017 alone). Just the idea of getting a piece of that $32M is inspiring to me. Don't you think? Click here to get a FREE account with Global Test Market. Spend $20 or more and receive a $10 balance in your account right away. Who are they? A one-stop site for everything you do online and get paid for doing that. As simple as that. Rewards: Cash paid via PayPal, Amazon gift cards, and retail voucher. Amount from paying surveys: Earn up to $50/survey plus test products for FREE and for keeps. Earn way more when you use it for more things aside from taking surveys for cash. Our review: You'll get extra $5 for taking the first five surveys and up to $50 per survey. Also, just spend $20 or more and receive a $10 balance on your account if you sign up thru my link(Desktop l Mobile). Imagine this… you could earn over $60 (i.e., $5 bonus, $50/survey, and $10 for spending $20) in a few hours. That is amazing. 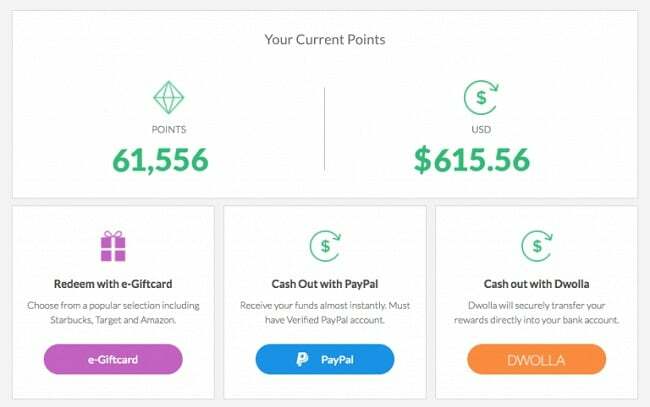 Click now to create your MyPoints (Desktop l Mobile) account for FREE, and start going for the bonuses, and start seeing money coming in. The world's No. 1 paid survey site. Since it started in 2014, it has paid over $32M + to its members. Who are they? A popular consumer panel that paid over $20M last year to its members. Rewards: Cash, gift cards, contests, vouchers, and prize draw. Amount per survey: Roughly 200 points convertible into cash. Plus, test products for free. Our review: If you are struggling to get the right site, then, trust MySurvey. It didn't become the world's #1 survey for pay site for no reason. Last year, I got a Crock-Pot and $400 stand mixer for FREE. There aren't any surprises with using it, which won't make you second guess about its legitimacy. With MySurvey, you'll find yourself with money and products all because you took its easy, quick legitimate paid surveys. Earn $1.50 per person you refer to MySurvey. Click here to create a MySurvey account for FREE now and be one of those people who make money from surveys. One of the best survey sites that are known as one of the most-friendly survey sites. Find out why! Who are they? : One Opinion is one of the best-paid surveys at home. If you are tired of trying surveys and not getting qualified, then, your best bet is to use this panel. According to many, One Opinion gets its users the most qualifications out of the dozens of other survey sites out there. Amount from paying surveys: According to one member, the number of points you get for surveys are great, and they get credited to your account immediately. Many say that most surveys pay $1 per 6 minutes. You are talking $5 for 30 minutes or $10 for an hour. Our review: No other surveys can get you the most qualifications than One Opinion. There's no site that comes even close to One Opinion on the number of survey opportunities. Click here to create an account with One Opinion for FREE. The registration isn't open for long. So, take this opportunity to open one of the best surveys for cash only and be on your way to make money from surveys. Earn for just about anything you do online. Seriously, anything! Who are they? 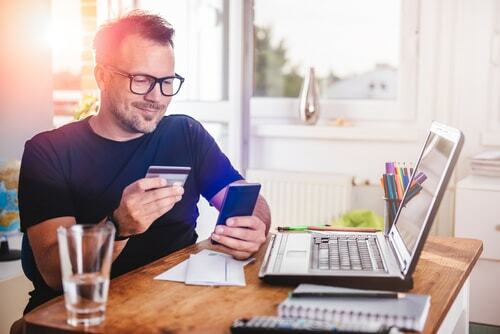 EarningStation – one of the few surveys for cash only – is similar to Swagbucks in that you can earn by watching videos, taking surveys, using coupons, and shopping online. Amount from paying surveys: There are times when my wife makes $5 to $10 bucks an hour, which is pretty good when you're just sitting on your couch and doing nothing. EarningStation will send you an email about surveys you are qualified 100%. You will earn points called StationDollars, which you can redeem for gift cards and cash. Our review: Only a handful of other sites like Swagbucks can deliver the power to help you make money doing almost anything you do on and offline. Earn $10 after 5 website sign-ups. Earn in various ways: Watching, playing games, and shopping. Make money from surveys and money even on current promotions. Click here to create an account EarningStation for FREE and start taking surveys for cash only to make you money. The top paid online site to take surveys for cash for 3 years in a row now. Who are they? Pinecone Research is the trusted leader in the survey panel industry. Rewards: Cash via Paypal, check, Amazon gift cards, iTunes gift cards, VISA prepaid card, etc. Earn extra $5 BONUS just for signing up. Amount from paying surveys: Typically earn $3/survey. Earn as high as $12 – $15 per survey and product testing. Our review: Pinecone Research's payment scheme is one of the reasons that it's always on the top and why everyone loves it and why we love it. There's no guessing game on how much you'll make per survey. Pinecone surveys typically last around 15 minutes and rarely disqualify users. Click here and take paid surveys now with Pinecone for FREE and make the money you expect to make. A pioneer in the world of paid market research that has been touted as one of the best survey sites ever. Who are they? Opinion Outpost is a free community where members get paid for sharing their opinions on new and current topics and products. Rewards: Cash via PayPal, Amazon claim codes, iTunes gift cards, and donations. Our review: I have not used it personally, but my sister has, and she loves it. She makes $150/mo in her spare time, sitting down, and while watching TV. Surveys are e-mailed to you directly, and Opinion Outpost will enter you on the $10,000 quarterly cash draw for every survey you get disqualified. Click here to join Opinion Outpost now for FREE, get a chance to win $10,000, and make money from paid surveys. The all-in-one surveys for cash only that helps you earn money on just anything you do online. Who are they? InboxDollars is purely a cash-based online rewards site that passes the revenue it generates from advertisers to its members. Rewards: Cash via check or VISA cash card. Earn extra $5 BONUS just for signing up. Amount from paying surveys: Varies. Our review: You cannot pass this site. It's more than just a site. It's a money-maker, survey for money site. It has awarded over $50M to date. You'll earn money from using coupons, playing games, shopping, answering surveys, using a toolbar, reading emails, and referring friends. Click here to get started with InboxDollars for FREE. If you want to make money from doing surveys and more, use InboxDollars. One of the best surveys for cash only that pay up to $180/year that's really not a survey site. Who are they? With 51K Facebook followers, you know this is the real deal. Survey Savvy helps you make money from surveys without you taking a survey. Yes, it's one of the only few surveys for cash only that is really not a survey site. Rewards: Cash paid via PayPal. Amount from paying surveys: You will earn $5 per device per month for each month Survey Savvy is installed with up to $180 earning per year. One member received a $200 VISA gift card in just 3 days of taking surveys. You could be this person. Click here to create an account Survey Savvy for FREE and start taking surveys to make you money. Period. Considered as one of the best survey sites and get rewarded without really taking paid surveys. Who are they? : Do you pay the internet bill? If yes, then, might as well make your internet usage count. If you do not like taking survey money tasks because of the time you have to dedicate, then, this is for you. The only things you need to do are sign up, download, and install Neilsen Digital Voice's app. That's all you need. Rewards: Cash paid via PayPal and points. Amount from paying surveys: Depends on the day. Our review: It's one of those surveys for cash only that isn't really needing your effort and time to take surveys. Isn't that cool? All you have to do is down the app and let it run in the background, and you are good to go. It's a complete survey panel. You can earn without taking a single survey. At the same time, you can also earn additional rewards by taking surveys. The decision is up to you. I don't know a lot of other sites that do this. I do know when it comes to rewarding people from taking and not taking paid surveys, Neilsen Digital Voice comes first to my mind. Download Nielsen Digital Voice surveys now for FREE and gets a chance to receive a portion of $10,000 prize. Do you know of any other surveys for cash only? Which one of these fast cash surveys you like the most and which ones you don't? Great list! Quick question: have you had trouble qualifying for surveys? I’ve spent a bunch of time answering questions to determine eligibility for surveys. But I’ve never had luck actually qualifying to take a paid survey. Just wondered if you’d come across that. I may just be the all-around wrong demographic, lol! It’s probably the demographics. I do get disqualified a lot of times for sure. I tried over a hundred of survey sites and I came down to just few. Those few are the ones that helped me make money.